Primary and revision rhinoplasty are challenging procedures. In order to obtain aesthetically pleasing results, ensure patient satisfaction, and minimize complications, the rhinoplasty surgeon must possess a thorough knowledge of nasal anatomy and ideal facial aesthetic proportions. The rhinoplasty surgeon must also be familiar with all types of graft material and the current methods to correct nasal deformities. 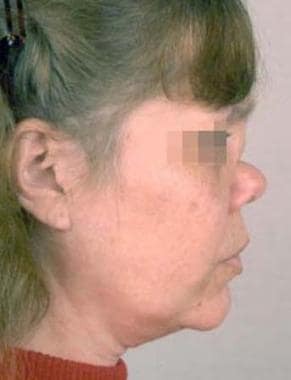 This article addresses augmentation of the deficient nose, as seen in the images below. Young boy (same patient as in previous image) with bilateral cleft lip and palate who also had midface hypoplasia and required nasal augmentation, shown after dorsal nasal augmentation was accomplished using autologous rib grafts. It was fashioned slightly larger than needed to account for the patient's future facial growth. Woman (same patient as in previous image) with a subtype of midline granulomatous disease that caused nasal collapse, shown after augmentation with both autologous rib and cartilage grafts. AlloDerm was also used for additional augmentation. Rhinoplasty originated as a reconstructive procedure, essentially in the form of nasal augmentation. In 500 BCE, Sushruta pioneered nasal reconstruction with the use of the nasolabial flap. In the 1800s, two German surgeons, Carl von Grafe and Johann Dieffenbach, made significant advances in rhinoplasty techniques. In subsequent years, Dr John Roe described the endonasal approach in 1887, and Drs. Joseph Safian and Gustave Aufricht described advanced techniques. Several publications continue to propose innovative ways to correct nasal deformities and improve outcomes. In addition to autologous materials, many new synthetic and allogenic materials have become available for nasal augmentation surgery. Rhinoplasty requires a careful preoperative analysis of the patient's problem during the office visit and meticulous surgical execution in the operating room. The surgeon must elicit the expectations, concerns, and motivations of the rhinoplasty patient. Establishing a good rapport with the patient can help increase the potential for postoperative satisfaction. An accurate nasal history should alert the surgeon to a previous history of nasal trauma, nasal obstruction, sinus disease, and allergic disorders. A detailed history of any comorbid conditions, current prescribed medications, over-the-counter medications, illicit drugs, and herbal supplements must also be elicited. Any agents such as aspirin, anticoagulants, and herbal supplements (eg, St. John’s wart, ginkgo, ginger, vitamin E) should be discontinued at least 2 weeks prior to surgery to minimize the risk of intraoperative and postoperative bruising and bleeding. The anatomic examination should include an analysis of the external nasal deformity and internal nasal anatomy. The endonasal examination should be performed after adequate decongestion with a vasoconstrictor. Specific attention should be given to any external nasal valve collapse upon inspiration, the adequacy of the internal nasal valve, tip ptosis, septal deviation, the size of the inferior turbinates, septal perforation, and the existence of any purulence in the middle meatus. Preoperative photographs must be obtained. They should include a frontal view, lateral view in the Frankfort horizontal plane, basal view, and oblique view. Informed consent must be obtained and documented. Any questions or concerns the patient has should be addressed prior to the surgical procedure. Nasal obstruction secondary to anatomic deformities or variations from the ideal nasal aesthetics can be improved with surgical intervention. Examples include internal nasal valve and/or external nasal valve collapse upon inspiration. The internal nasal valve is formed by the septum medially and the upper lateral cartilages superiorly. The ideal angle for adequate airflow has been reported to be 10-15°. Inadequate airflow can occur when this angle is more acute. In addition, encroachment of the inferior turbinate laterally at the internal nasal valve can further worsen the obstruction. Internal nasal valve collapse is observed in some patients who have previously undergone a nasal dorsal reduction during a rhinoplasty. For more information, see Rhinoplasty, Postrhinoplasty Nasal Obstruction. Overresection of the nasal dorsum and the upper lateral cartilages can lead to loss of structural support at the internal nasal valve, which can result in obstruction. Correction of this condition usually requires reestablishing the normal angle with the use of spreader grafts between the septum and the upper lateral cartilages. Patients also may require external nasal valve augmentation with batten grafts, rim grafts, or other structural support for a patent airway. The inferior turbinates may need to be reduced or partially excised. Tip ptosis can also lead to nasal obstruction. Tip ptosis can result from aging, trauma, or previous surgical intervention that caused a loss of the crucial tip-supporting mechanisms. Augmentation of the nasal tip with grafts and restoration of the tip-supporting mechanisms may be required to alleviate functional nasal obstruction. Another indication for augmentation of the nose is a deficient nasal dorsum. 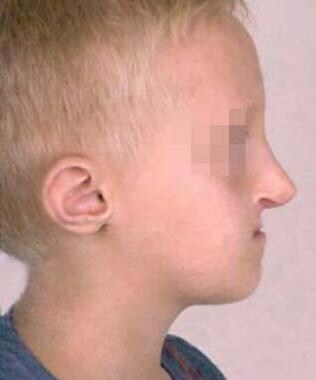 Nasal dorsal deficiency can result from overresection of the nasal dorsum during a prior rhinoplasty, in patients with Wegener granulomatosis or Binder syndrome (maxillonasal dysplasia), or secondary to septal necrosis from a septal hematoma or cocaine abuse. Such factors can cause a saddle-nose deformity due to the loss of underlying septal support. These patients require nasal dorsal augmentation. Several different materials can be used to augment the nose. Available augmentation materials can be classified as autologous grafts and nonautologous graft materials. Autologous materials consist of bone, cartilage, or both harvested from the nasal septum, ear, rib, inferior turbinate, and calvaria. [2, 3] The use of tensor fascia lata has also been described. The main nonautologous materials include Medpor, silicone, silastic, GORE-TEX, and the human acellular dermis product marketed as AlloDerm or porcine acellular dermal product marketed as Permacol or Stratus. In addition injectables such as hyaluronic acid have been utilized for temporary and minor corrections  . Opinions regarding the indications for and outcomes with using these materials vary. Autologous tissue is readily available, and the morbidity associated with harvesting the autologous grafts is low. Many prominent surgeons believe the aesthetic and long-term functional outcomes are superior and the complication rates are low. Therefore, they advocate the use of autologous grafts over nonautologous materials. Bone is usually needed only in patients with very deficient dorsi with saddle-nose deformities. Autologous tissues may also be required in patients with severe nasal defects in whom near-total reconstruction is planned. Bottini et al presented a 79% satisfaction rate in their series of 132 patients who underwent reconstruction of nasal defects using various autologous graft techniques. Gentile and Cervelli reviewed 123 cases in which 84% of treated patients showed cosmetic improvements, with results satisfactory to both surgeon and patient, and 94% of the operated cases resulted in functional improvement. Stuzin and Kawamoto reported their use of cranial bone grafts to correct saddle-nose deformities. These grafts require careful placement and rigid fixation. The cartilage grafts can be used as struts,  anatomic replicas, or morselized/crushed grafts wrapped in fascia, Surgicel, or other components. In some cases, a combination of autologous and nonautologous materials may be necessary. One concern with bone grafts is the potential for resorption. Powell and Riley reviewed 850 calvarial bone grafts to the nose in 170 patients and found resorption rates of as high as 30%. Given this concern and the increased morbidity of harvesting bone grafts, most surgeons prefer using cartilaginous grafts. Septal cartilage should be harvested with caution. At least a 10-mm dorsal and caudal strut is very important for nasal structural support. In revision rhinoplasty cases, septal cartilage may not be available. In such cases, ear cartilage, rib cartilage or both can be harvested. Some inherent disadvantages with the use of auricular cartilage are the inherent curves in ear cartilage and the fragility of the cartilage compared with septal or rib cartilage. However, ear cartilage is ideally suited for alar rim and nasal tip reconstruction. The amount of ear cartilage available is usually inadequate for dorsal augmentation. Ear cartilage can be harvested via an anterior or posterior approach. The resultant morbidity is minimal in either approach. When more structural support or rigidity is needed for augmentation, rib cartilage is a great alternative. The ninth floating rib is an ideal location to harvest the graft. This location provides the surgeon with a long, straight piece of structurally strong cartilage. Adherence to the Gibson principles of balanced cross-sectional harvesting leads to an ideally shaped graft that holds its final shape without distortion or warping. This involves amputation of an equal amount of cartilage from both sides to minimize warping of the graft. Meticulous surgical technique is required to prevent inadvertent entry into the thoracic cavity. With adherence to sound surgical principles, the rate of donor site complications is usually very low. Some advocate making an anatomic replica using an osteocartilaginous graft. Tosun et al presented a decade of experience using allogenous cartilage grafts. They compared allogenous grafts to autogenous grafts and found no differences in resorption and complications. Kridel et al reviewed 357 cases in which allogenous cartilage was used over 24-y period; they found it to be a stable graft in rhinoplasty and with a very low complication rate (3.25%). They believe that the allograft should be considered when septal or auricular cartilage is not available or even as primary grafting material, given their findings. The nose is composed of skin, subcutaneous tissue, nasal mucosa, cartilage, and bone. The upper third of the nose is composed of the nasal bones, the middle third is composed of the nasal septum and the upper lateral cartilages, and the lower third encompasses the lower lateral cartilages and the caudal aspect of the cartilaginous septum. The midline septal cartilage provides underlying support to the lower two thirds of the nose. While this is the basic anatomic framework, variations and asymmetry are present in many individuals. The nasal bones vary in thickness and width from the nasofrontal suture line cephalically to the end of the nasal bones caudally. They are thick and widest at the nasofrontal suture, narrow at the nasofrontal angle before they widen, and become thinner approximately 9-12 mm below the nasofrontal angle. These anatomic variations in thickness and width are important to remember when osteotomies are planned. The thickness of the soft tissue and skin of the nose also varies at different anatomic points. The skin and soft tissue covering the nasal skeleton is thickest in the supratip region, while it is thinnest at the bony cartilaginous junction of the nasal dorsum. These variations in skin and soft tissue thickness affect the final nasal contour and profile after nasal augmentation. For a detailed and illustrated description of nasal anatomy, see the Medscape article Nasal Anatomy. Augmentation rhinoplasty has relatively few contraindications. Any medical condition that inhibits patient safety during the procedure is a contraindication. Patients should not be taking any anticoagulants (eg, enoxaparin [Lovenox], warfarin [Coumadin], heparin), aspirin, or nonsteroidal anti-inflammatory drugs before the surgical procedure. Any herbal supplements such as ginger, ginkgo, or vitamin E should also be avoided. Allergies to any type of nonautologous material must be identified prior to the procedure. Patients with inappropriate motivations for seeking rhinoplasty must be carefully screened. Canady JW. Evaluation of nasal obstruction in rhinoplasty. Plast Reconstr Surg. 1994 Sep. 94(3):555-9. [Medline]. Jones ME, Westreich RW, Lawson W. Augmentation of nasal tip projection using the inferior turbinate: review of technique and evaluation of long-term success. Arch Facial Plast Surg. 2008 Jan-Feb. 10(1):34-7. [Medline]. Liu L, Bu Z, Fan J, Tian J, Gan C, Yang Z, et al. Augmentation of the Nasal Dorsum Using the Multistrip Autologous Cartilage Technique. Plast Reconstr Surg. 2017 Dec. 140 (6):1163-1166. [Medline]. Karaaltin MV, Orhan KS, Demirel T. Fascia lata graft for nasal dorsal contouring in rhinoplasty. J Plast Reconstr Aesthet Surg. 2009 Oct. 62(10):1255-60. [Medline]. Bray D, Hopkins C, Roberts DN. Injection rhinoplasty: non-surgical nasal augmentation and correction of post-rhinoplasty contour asymmetries with hyaluronic acid: how we do it. Clin Otolaryngol. 2010 Jun. 35(3):227-30. [Medline]. Bottini DJ, Gentile P, Donfrancesco A, Fiumara L, Cervelli V. Augmentation Rhinoplasty with Autologous Grafts. Aesthetic Plast Surg. 2007 Oct 26. [Medline]. Gentile P, Cervelli V. Nasal dorsum reconstruction with 11th rib cartilage and auricular cartilage grafts. Ann Plast Surg. 2009 Jan. 62(1):63-6. [Medline]. Stuzin JM, Kawamoto HK. 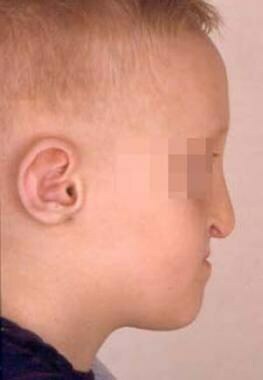 Saddle nasal deformity. Clin Plast Surg. 1988 Jan. 15(1):83-93. [Medline]. Powell NB, Riley RW. 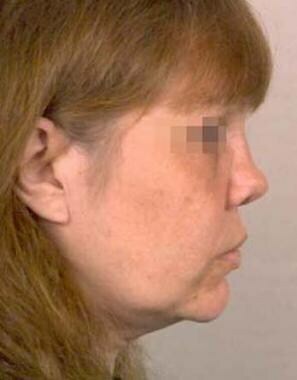 Facial contouring with outer-table calvarial bone. A 4-year experience. Arch Otolaryngol Head Neck Surg. 1989 Dec. 115(12):1454-8. [Medline]. Lee SH, Koo MG, Kang ET. Septal Cartilage/Ethmoid Bone Composite Graft: A New and Improved Method for the Correction Underdeveloped Nasal Septum in Patients with Short Noses. Aesthetic Plast Surg. 2017 Apr. 41 (2):388-394. [Medline]. [Full Text]. Kridel RW, Sturm AK. Dorsal Augmentation with Homologous Rib. Facial Plast Surg. 2017 Apr. 33 (2):195-201. [Medline]. Tosun Z, Karabekmez FE, Keskin M, Duymaz A, Savaci N. Allogenous Cartilage Graft Versus Autogenous Cartilage Graft in Augmentation Rhinoplasty: A Decade of Clinical Experience. Aesthetic Plast Surg. 2007 Oct 30. [Medline]. Kridel RW, Ashoori F, Liu ES, Hart CG. Long-term use and follow-up of irradiated homologous costal cartilage grafts in the nose. Arch Facial Plast Surg. 2009 Nov-Dec. 11(6):378-94. [Medline]. Taylor CO, Owsley TG. Gore-Tex nasal augmentation. Plast Reconstr Surg. 1996 Jan. 97(1):252. [Medline]. Conrad K, Torgerson CS, Gillman GS. Applications of Gore-Tex implants in rhinoplasty reexamined after 17 years. Arch Facial Plast Surg. 2008 Jul-Aug. 10(4):224-31. [Medline]. Rohrich RJ, Muzaffar AR. The Turkish Delight: A Pliable Graft for Rhinoplasty. Plast Reconstr Surg. 2000 May. 105(6):2242-2243. [Medline]. El-Shazly M, El-Shafiey H. Soft versus hard implants in dorsal nasal augmentation: a comparative clinical study. Aesthetic Plast Surg. 2012 Oct. 36(5):1019-27. [Medline]. Hopkins C, Walker R, Lee S, Roberts D. Permacol in augmentation rhinoplasty: how we do it. Clin Otolaryngol. 2009 Feb. 34(1):68-75. [Medline]. Wong CH, Daniel RK, Lee ST. Asian Cleft Rhinoplasty: The Open Structural Approach. Aesthet Surg J. 2017 Dec 13. 38 (1):28-37. [Medline]. Rosenberger ES, Toriumi DM. Controversies in Revision Rhinoplasty. Facial Plast Surg Clin North Am. 2016 Aug. 24 (3):337-45. [Medline]. Endo T, Nakayama Y, Ito Y. Augmentation rhinoplasty: observations on 1200 cases. Plast Reconstr Surg. 1991 Jan. 87(1):54-9. [Medline]. Sheen JH. Tip graft: a 20-year retrospective. Plast Reconstr Surg. 1993 Jan. 91(1):48-63. [Medline]. Han SK, Shin SH, Kang HJ, Kim WK. Augmentation rhinoplasty using injectable tissue-engineered soft tissue: a pilot study. Ann Plast Surg. 2006 Mar. 56(3):251-5. [Medline]. Adams WP Jr, Rohrich RJ, Gunter JP, et al. The rate of warping in irradiated and nonirradiated homograft rib cartilage: a controlled comparison and clinical implications. Plast Reconstr Surg. 1999 Jan. 103(1):265-70. [Medline]. Constantian MB. Distant effects of dorsal and tip grafting in rhinoplasty. Plast Reconstr Surg. 1992 Sep. 90(3):405-18; discussion 419-20. [Medline]. Eisenberg I. A history of rhinoplasty. S Afr Med J. 1982 Aug 21. 62(9):286-92. [Medline]. Gilmore J. Use of Vicryl mesh in prevention of postrhinoplasty dorsal irregularities. Ann Plast Surg. 1989 Feb. 22(2):105-7. [Medline]. Gryskiewicz JM, Rohrich RJ, Reagan BJ. The use of alloderm for the correction of nasal contour deformities. Plast Reconstr Surg. 2001 Feb. 107(2):561-70; discussion 571. [Medline]. Guerrerosantos J. Augmentation rhinoplasty with dermal graft. Plast Reconstr Surg. 2004 Mar. 113(3):1080-1. [Medline]. Gunter JP, Friedman RM. Lateral crural strut graft: technique and clinical applications in rhinoplasty. Plast Reconstr Surg. 1997 Apr. 99(4):943-52; discussion 953-5. [Medline]. Hamra ST. Crushed cartilage grafts over alar dome reduction in open rhinoplasty. Plast Reconstr Surg. 2000 Feb. 105(2):792-5. [Medline]. Peck GC Jr, Michelson L, Segal J, Peck GC Sr. An 18-year experience with the umbrella graft in rhinoplasty. Plast Reconstr Surg. 1998 Nov. 102(6):2158-65; discussion 2166-8. [Medline]. Rogers BO. Early historic development of corrective rhinoplasty. Millard DR, ed. Symposium on Corrective Rhinoplasty. St. Louis, Mo: CV Mosby; 1976. Safian J. Corrective Rhinoplasty Surgery. New York, NY: Paul B. Hoeber, Inc; 1935. Sheen JH. The ideal dorsal graft: a continuing quest. Plast Reconstr Surg. 1998 Dec. 102(7):2490-3. [Medline]. Stucker FJ, Hoasjoe DK. Nasal reconstruction with conchal cartilage. Correcting valve and lateral nasal collapse. Arch Otolaryngol Head Neck Surg. 1994 Jun. 120(6):653-8. [Medline]. Stupak HD, Moulthrop TH, Wheatley P, Tauman AV, Johnson CM Jr. Calcium hydroxylapatite gel (Radiesse) injection for the correction of postrhinoplasty contour deficiencies and asymmetries. Arch Facial Plast Surg. 2007 Mar-Apr. 9(2):130-6. [Medline]. The authors and editors of Medscape Reference gratefully acknowledge the contributions of previous authors C Coleman Brown, MD, Shashidhar Kusuma, MD, and Francis A Papay, MD to the development and writing of this article.